The Company is the controller for the processing of the personal data collected from users of the Company’s website. 3) WHAT IS A COOKIE? WHICH ARE THE TYPES OF COOKIES? A cookie is a small text-based file that is placed on your computer, mobile phone or similar device, with information about your navigation on the website. There are temporary and permanent cookies. Temporary cookies, also known as session cookies, are saved on your device until you close the browser. Permanent cookies have an expiration date and when this date has passed, the cookie is deleted when you return to the website that created it. Cookies can be “first-party cookies” or “third-party cookies”. First-party cookies are cookies that are placed on the website by the Company. Third-party cookies are cookies that are placed on the website by another party than the Company. These are cookies, which are set up to improve the functionality of the website. For example, cookies that remember the content you previously viewed on this website or the email address and password you provided when registering during an earlier visit to this website. Using Functional cookies, therefore, may allow us to serve you content tailored to your interests and save you the time of having to re-register or re-enter information when you re-visit this website or try to access certain member-only sections. These are cookies that are set on E-Tech Components UK Ltd’s website by affiliated companies (e.g. Google, Linkedin or other). They may use the data collected from these cookies to anonymously target advertising to you on other websites, based on your visit to this Website. For example, if you use a social widget (e.g. the Facebook icon) on the Website, it will record your “share” or “like”. Facebook (as the company setting the cookie) will collect the data. This is known as a “Third Party’’ cookie. We will not use any information reported by Google Analytics Demographics and Interest Reporting to identify any individual user of our site. Find out more about Google Analytics Demographics and Interest Reporting. If you have provided your consent for the cookies on E-Tech Components UK Ltd’s website or any affiliated company (e.g. Google, Linkedin or other), the Company will save data for the purposes mentioned above. The legal ground for the processing is your consent. If you do not want sites to store cookies on your PC, you can always withdraw your consent and block cookies used by us or our affiliated companies from your browser’s settings. However, blocking cookies might prevent some pages from displaying correctly, or you might get a message from a site letting you know that you need to allow cookies to view that site. Blocking cookies might prevent some pages from displaying correctly, or you might get a message from a site letting you know that you need to allow cookies to view that site. 4) WHAT SPECIFIC COOKIES ARE USED ON THIS WEBSITE AND FOR WHAT PURPOSE? In the table below, the cookies that we use on our website are specified, together with information about the purpose, what personal data are collected, the duration and whoever handles the cookie. 5) WHAT LEGAL GROUND DOES THE COMPANY HAVE FOR PROCESSING OF YOUR PERSONAL DATA? The Company processes your personal data as above based on consent from you, which you provided in connection with visiting our website. 6) CAN I SAY NO TO COOKIES? If you do not want to allow cookies to be stored on your device, you can usually completely or partially turn them off in your browser’s settings. For example, in some browsers you can choose to block all cookies, only accept first-party cookies, or delete cookies when you close your browser. You can also delete cookies stored from before in your browser settings. Keep in mind that if you choose to delete or block cookies, the use of our website and our services may not work as a consequence. 7) WHICH RECIPIENTS CAN WE SHARE YOUR DATA WITH? 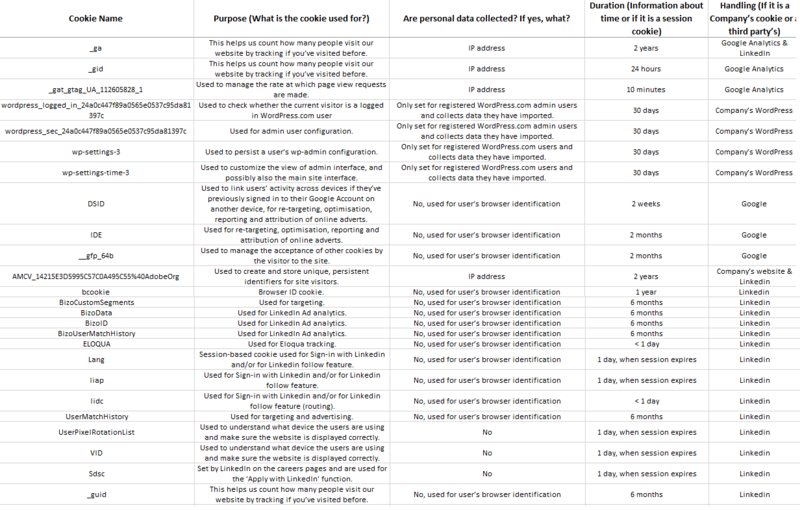 The personal data collected through third-party cookies will also be disclosed to the third party that is providing the cookie (see table below under item 4). Refer to the corresponding third-party’s Policies or Terms and Conditions for further information on their use. The Company may also transfer your personal data to companies Members of Lagercrantz Group AB. These recipients only have the right to process your personal data on behalf of the Company in connection with performing a service for the Company, e.g. delivering ordered goods to you. The Company takes all reasonable legal, technical and organisational measures in order to ensure that your data is handled securely and with an adequate level of protection during transfer to or sharing with such selected third parties. The Company can also provide your personal data to public authorities if we are obliged to do so by law. In the case that all or parts of the Company’s operations are sold, the Company can transfer your personal data to a potential buyer of the operations. Your personal data will only be processed in the EU/EEA. • Right to access/extract from register. You have the right to get answers about whether the Company processes personal data about you. If this is the case, you have the right to information about, among other things, what personal data is being processed, the purpose, which external recipients receive your personal data and how long we save your personal data for. • Right to data portability. You have the right to request a copy of the personal data, which you have provided to the Company, in a structured, commonly used and machine-readable format. You also have the right to request that the Company transfer these personal data to another controller. The right to data portability applies to personal data, which is processed in an automated matter, and which is based on your consent or on an agreement you are party to. • Rectification of inaccurate data. You have the right to request that the Company rectify inaccurate or incomplete information about you. • Erasure of certain data. You have the right to request that the Company erase your personal data under certain circumstances, e.g. if the personal data are no longer necessary for the purpose that we collected the personal data for. • Right to object to the Company’s processing of personal data. You have the right to object to the Company’s processing of your personal data. The right to object applies, inter alia, if the processing is based on a balancing of interests, unless the Company can demonstrate (i) imperative legitimate grounds for the processing which override your interests, rights and freedoms or (ii) if the processing occurs for the establishment, exercise or defence of legal claims. • Right to object to direct marketing. You have the right to object at any time to the Company processing your personal data for direct marketing. If you object to such processing, the Company without unnecessary delay shall cease all direct marketing to you. • Right to restriction of processing your personal data. You have the right to request a restriction of the Company’s processing of your personal data in certain cases. For example, if you have contested the accuracy of your personal data, you can request a restriction of the processing during a period of time to enable the Company to verify the accuracy of the personal data. • Complaints. If you have a complaint about the Company’s processing of your personal data, you have the right to lodge such a complaint with the UK Data Protection Authority.